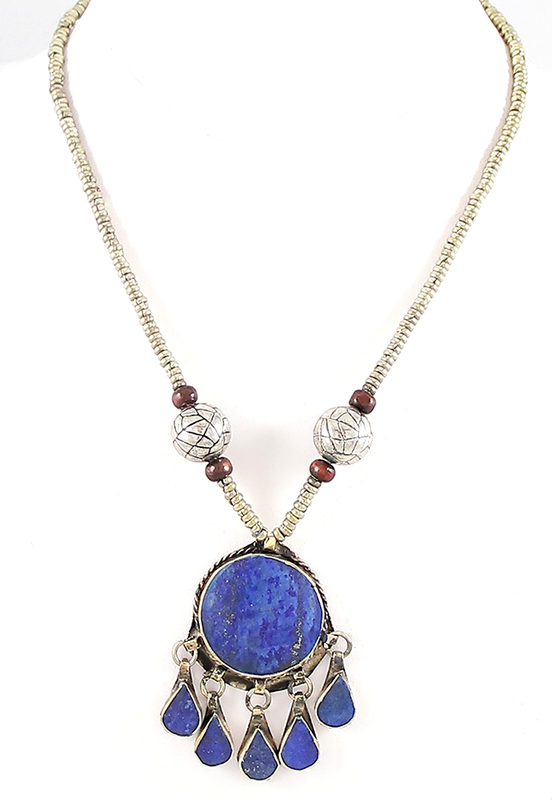 This beautiful Tribal necklace with circular Lapis pendant and teardrops is the perfect addition to your belly dancing wardrobe or everyday wear. This beautiful Tribal necklace with circular Lapis pendant and teardrops is the perfect addition to your belly dancing wardrobe or everyday wear. Set on a strand of small brass and wooden beads, it is also accented with a silver etched bead on either side. Handmade by Afghani artisans. Approximately 18.5 inches end-to-end, Main pendant is 1.25 inches in diameter. I love this necklace. It's good quality and exactly as pictured.